It came as thousands massed in Cairo and other Egyptian cities for an 18th day of protest to demand Mr Mubarak's resignation. Protesters responded by cheering, waving flags, embracing and sounding car horns. "The people have brought down the regime," they chanted. 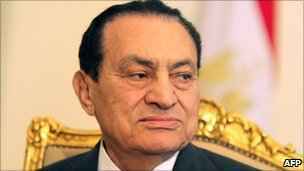 Mr Suleiman said Mr Mubarak had handed power to the high command of the armed forces.